The technocrats of Masdar could hardly be accused of a lack of ambition. The seven-year-old city in Abu Dhabi, which aims to be the world’s first zero-carbon city, aspires also to be a global centre of excellence for innovative clean-tech water companies. “Masdar can be the Silicon Valley of water,” says Mohammed El Ramahi, Masdar’s head of utilities and asset management. He is certain that this part of the Middle East can be to water what California is to the microchip. With predictions that the water tech industry – covering desalination, purification, recycling, rainwater collection and hydro-electricity – will be worth $1tn by 2020, it is perhaps no surprise that Abu Dhabi wants in on the action. Continue reading at Guardian Sustainable Business. 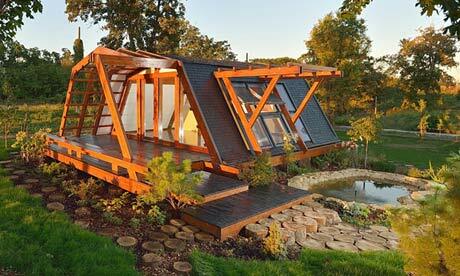 Can sustainable eco houses become mainstream? Well-heeled consumers will never find it hard to splash out on sustainable mod-cons, but is concept truly scaleable? The eco home that Max O’Flaherty designed – which won his firm a coveted EU award at the Royal Institute of British Architects annual awards last month – nearly didn’t get built at all. The House on Mount Anville, which put his practice, Aughey O’Flaherty, in the same bracket as star architects such as Zaha Hadid, was almost denied planning permission on the grounds that it would not have been sustainable to knock down its precursor: a 1970s bungalow. 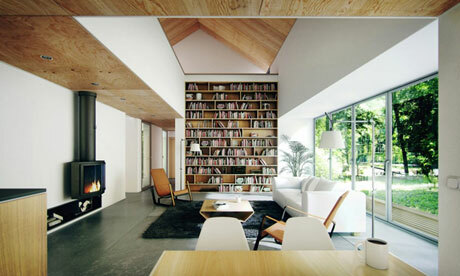 “It was a leaky, drafty, poorly insulated house and there wasn’t much architectural merit,” says O’Flaherty. Thankfully, he and his team were able to demonstrate to the council that replacing it with a new glass, brick and timber structure would be far more energy efficient. A new breed of internet startup is taking on the big guns of the tech world. Seeking to capitalise on consumer disillusionment with the established order in the wake of headlines about tax-dodging, personal data profiteering and poor factory conditions, these startups represent the radical face of the internet. Unusually for a tech company, however, it is not technological innovation that gives them their unique selling point. Rather it is the promise to do social and environmental good. Can Dow’s approach to water recycling recharge its reputation? For Dow’s opponents, the company’s approach to sustainable water management fails to wash away its alleged sins. But are the criticisms justified? The Dow Chemical Company, one of the largest chemical manufacturers in the world, wants you to know that it ‘gets’ concerns about sustainablewater management. At the Rio+20 summit, the firm signed a communique calling for greater collaboration between private and public sectors to address water scarcity, and has sponsored a number of initiatives in recent years fromwater forums to fun runs and concerts to boost public awareness. Pointing to the planet’s rising population and rapid urbanisation as evidence of intensifying pressure on fresh water supplies, Desai said businesses are increasingly taking a second look at how the world manages this finite resource. “Finding alternative sources is clearly a critical issue”. One solution is research and development, and Dow has been funnelling millions of dollars into desalination and water recycling technologies. Another, Desai said, is pursuing innovative collaborations. One partnership the company trumpets is taking place in the city of Terneuzen, in south-western Netherlands. At first glance, it’s hard to imagine that Terneuzen has a water problem. The population of this seaport is just 55,000 – so small that it would hardly qualify for city status in many countries. The river Scheldt lies to the north, a canal to the west. Yet Terneuzen is so desperately short of fresh water that it has to import supplies from 120km away, from France. Part of the problem is that Terneuzen sits at sea level and its groundwater aquifers are contaminated by salty waters from the North Sea. But local industry is also a major drain on the city’s water supplies. Dow’s facility, its largest outside the United States, needs 22m cubic metres of water a year to operate. To put that into context, the population of the entire local region of Zeeuws-Vlaanderen, 100,000, requires just four million cubic metres. If the world were a vessel, would it be the Titanic – destined for catastrophe owing to the arrogance of its proprietors? Or Charles Darwin’s Beagle – on a voyage of continuous discovery propelled by science and reason? It’s a conundrum that comes to mind when reading an ambitious new report by GlobeScan and SustainAbility, which unashamedly draws on nautical metaphors, such as the vagaries of navigating the high seas, to help us understand the many risks to human development and the environment. The report is the end product of an 18-month Regeneration Roadmap research exercise which took in the views of sustainability experts, white papers, as well as two global public opinion polls. It recaps progress (and failures) since the 1972 UN Conference on the Human Environment in Stockholm, the 1987 Brundtland Commission report and the 1992 Rio Earth Summit, arguing that without a change in course the world is unlikely to escape environmental, social and economic strife. Is the Responsible Jewellery Council an imitation ethical standards body? A coalition of NGOs has criticised the jewellery industry’s certification body. Consumer confidence is at stake. Jewellery is hardly a necessity of life. But according to Michael Rae, chief executive of the Responsible Jewellery Council (RJC), that’s not the point. However, “human emotion” has created a dilemma for jewellery companies, as high-profile campaigns against conflict minerals and dirty gold have raised public concern about the ethical footprints of supply chains. CSCLeaders is an annual gathering of 100 of the brightest minds in business, government and civil society. Drawn from across the Commonwealth, participants reflect on solutions to real-life complex challenges while learning and networking with peers. Those attending last month’s conference in London and Oxford were asked the question: “How do people from communities across the world become bridge-makers in the global networks of the future?” Find out more here and watch video highlights here. The application round for next year’s event opens on 1 May 2013. If you operate at a senior, strategic level in your organisation you can apply here. Interview with the Oxfam policy advisor leading the charity’s latest campaign to drive up sustainability standards among the world’s top food and drinks companies. Last month Oxfam released a set of scorecards ranking the ethical practices of the “Big Ten” food and drinks companies. The firms, including Coca-Cola, Pepsi and Kellogg’s, between them make more than $1bn a day and have an enormous impact on the lives of people living in producer countries, usually for better but, sometimes, for worse. Erinch Sahan, private sector policy advisor at Oxfam GB, led the group of policy experts that compiled the scorecards. It took them over 18 months to compile the Behind the Brands dataset. No mean feat, the process involved detailed consultation with industry experts, academics and, of course, the companies themselves. In the end, the team settled on 276 indicators across seven key issues: land, women, farmers, workers, climate, transparency and water. A ranking of 1 to 10 was assigned to each company. The biggest loser was London-headquartered conglomerate Associated British Foods, which came bottom with only 13 out of 70 points. Nestle meanwhile came top with a score of 38. A criticism of the scorecards is that they are founded solely on publicly available information such as annual reports and supplier codes. Policies and practices which remain unpublished cannot be considered, potentially punishing some high performing, if disclosure shy, companies. Sahan however says there is good reason for this approach. “For one, we don’t want to be custodians of private information. We want to look at information that others can validate.” Another important impetus is that Oxfam wants the companies to embrace greater transparency and incentivise a culture of openness. But will supermarket shoppers pay heed to the rankings? Sahan believes so. It all comes down to the simplest of reflexes, an outreached hand hovering above one plastic jar, carton or aluminium can only to switch to another made by a rival brand. Visit the Behind the Brands website here. See what the companies had to say about their rankings here. Where do you turn if you are a manufacturer of fast moving consumer goods and want to leverage industry best practices on supply chain management? Well, you could do a lot worse than getting in touch with AIM-PROGRESS, a Brussels-based forum set up for manufacturers to collaborate and swap experiences. Under the initiative, company representatives learn how to improve measurements of social compliance performance and share non-commercial, pre-competitive information about suppliers. Audits commissioned by one firm, for instance, are exchanged with others through the body’s system of mutual recognition. Find out more about the work of AIM-PROGRESS by visiting its website here. The initiative is open to suppliers as well as manufacturers; the only exception being that it does not admit arms or tobacco companies.